It’s a beautiful, memorable name for a ballplayer. It sounds right, echoing through the P.A. system or chanted by an excited, anticipatory crowd. Three other Fuenmayors have played professional baseball. There has never been another pro ballplayer named Balbino. Fuenmayor had not yet played a professional game. When Balbino did play, it was in the rookie-level Gulf Coast League in 2007, where he batted .174 with 68 strikeouts in 48 games. A year later, age 18, he returned to the GCL to lift his average to .307. That earned him a jump to Class-A Lansing in 2009, though he dropped precipitously down Baseball America‘s prospect rankings. In 2010, he played again for Lansing. In 2011, yes, Lansing once more, and then a reassignment to short-season Vancouver. In 2012, he spent the entire season with Vancouver. This is how the back of Balbino Fuenmayor’s baseball card looks. It does not tell the whole story. The whole story would include that July 12, 2009, day when he collected four hits against Burlington, including a game-tying three-run homer; and his April 12, 2010, five-hit performance at Great Lakes, where the fifth hit was an opposite field game-tying home run; and the way he became a cult hero in Vancouver with his crucial run-scoring knocks to help the Canadians win back-to-back Northwest League titles. In the Midwest League, the great Balbino had become an annual running gag: an ever-present member in the Lugnuts’ order, presenting the same April promise, the same batting-practice power, the same lack of walks and propensity for strikeouts, and the same lack of foot speed. He put on weight and moved to first base. He took off weight and moved back to third base. He held his bat higher, he held it lower. He bent his knees, he stood upright. Nothing helped the lightbulb go on. In the Northwest League, things were different: his feats were overwhelmed by the love extended to him. It helped that his personality remained the same as it ever was: honest, genuine, sweet-natured, and earnest. He spoke from his heart, and the language was bilingual: He had worked hard to break down any barrier that separated him from his English-speaking teammates. But Balbino was not developing, and the Minor Leagues at its core is about development of its players above all else. In 2013, he returned to Lansing, played 26 games, and then received his release from the Toronto Blue Jays organization. He was 23 years old, he was married, he had a baby, and he was a free agent. Balbino Fuenmayor was not yet done playing baseball. He latched on with the independent Frontier League Greys, a road team. Road teams are a brutal part of unaffiliated baseball: players spend the entire season in hotels, living out of their suitcase, and invariably falling victim to frustration, in-fighting, or general despair. There are wonderful aspects of organized professional baseball — but the travails faced by road teams have a way of making these aspects fade from consciousness. That brings us to this season. Fuenmayor had always struck out a lot. He’d never hit for average. And because of that, his power numbers had never matched his lofty power potential. When the season began, Fuenmayor batted eighth. But a 2-for-4 Opening Day chock full of impressive at-bats quickly convinced [manager Patrick] Scalabrini to move him up to the sixth spot in the lineup. A week later, he was hitting cleanup. Scalabrini and the rest of the Can-Am League were learning that the old scouting reports on Fuenmayor were no longer applicable. Pitches on the outer half were no longer being rolled over on mistaken attempts to pull the ball. Fuenmayor’s two-strike approach went from grip and rip to a shorter, controlled swing. On October 16, 2014, Baseball America named Balbino Fuenmayor its Independent League Player of the Year. In his very first at-bat for Caribes de Anzoategui, Fuenmayor homered off of top prospect Victor Sanchez. Entering Tuesday, he was batting .375 (6-16) with two doubles and six RBIs in five games. If it seems like everything nowadays is coming up Royals. Perhaps that same charm has extended to the unforgettable Balbino. 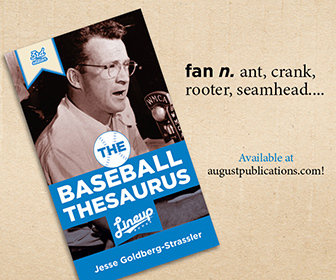 Jesse Goldberg-Strassler is the Voice of the Lansing Lugnuts and the author of The Baseball Thesaurus from August Publications. This story first appeared in the weekly Ballpark Digest newsletter. Are you a subscriber? It’s free! Click here to sign up for the newsletter.